An affordable round reel that’s rugged and durable enough to handle your toughest fishing challenges. The Kalex Round Baitcast Reel is equipped with Abu Garcia’s Anti Distortion Spool (ADS), which puts the spool bearings outside the spool to prevent torquing or binding under pressure. Other features include three stainless steel bearing plus one corrosion-resistant Instant Anti-Reverse bearing, six-pin centrifugal brake, powerful multi-disc drag, synchronized levelwind, ti-coated line guide, and recessed reel foot for a more compact profile. 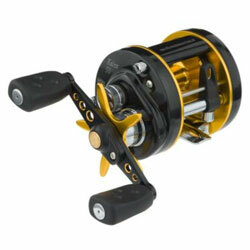 "Great reel and good price. Bought 2 Pinnacles last season, both needed repair before the end of the year. Stick to the more well-known brands, ABU being one of the best." "The New Garcia Kalex 50 Bait Cast is great mid-range priced reel. I can almost empty the line on the reel with a cast (exaggerating a little). It carries on the ABU tradition. I like them so much I now have five. They get a work out when I take them coastal fishing in Alabama for reds and specks." ""I bought this reel in April 2010. After 6 months of constant fishing, it's my opinion that this reel is the best choice for the money. I truly fish 3 days a week and have used this reel bait fish, jig, and troll."